Disability Network Southwest Michigan is pleased to bring you Disability Q & A to test your knowledge of disability-related topics. We post questions on Facebook and provide a link for you to check the answer and learn more about each topic. Q: How many possible combinations are there in a braille cell? Each braille cell is arranged with two dots across and three down. A-J are represented in the top two rows, K-T include the last row, and U, V, X, Y & Z add the last two dots to the first five letters. Interestingly, the letter W is an exception because the French alphabet did not include a W when braille was created. The symbol for W was added later. The braille system also includes symbols for punctuation, mathematic and scientific characters, music, computer notation, and foreign languages. 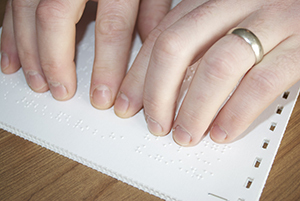 Follow this link to learn more about braille.